The app is very cool, easy to operate and best for Bollywood movie lovers. But before purchasing the premium subscription be sure that the movie you want to watch is available in the Spuul content library. After all, what you need is the great content and if you got that Spuul will definitely excel your experience. Spuul is not only on the smartphones but also allow to stream videos on to your PC, Mac, phone, tablet, and TV. Moreover, it also supports the Chromecast & Apple Airplay. 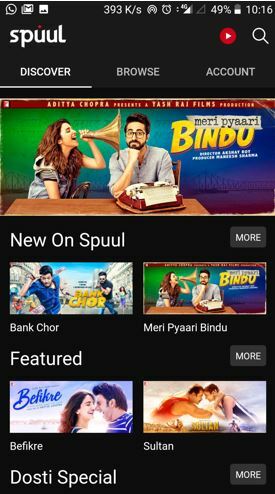 The Spuul app offers both free and premium account. Out of thousands of movies, some are free to download or stream online while other needs a premium account. 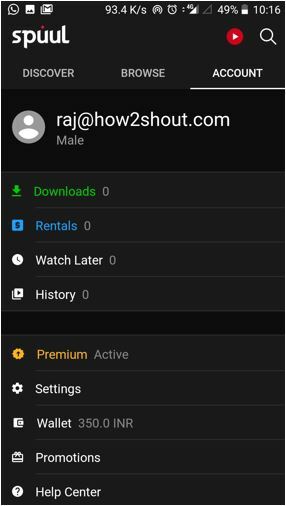 After using this app for a couple of days and watching the movies both free and premium online, here is our experience. Supports Android, iOS, Chromcast, PC, Android TV, and AirPlay. 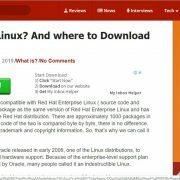 Allows downloading the free full-length movies under 60MB. Video quality can be adjusted according to the internet connectivity. Downloaded videos can be played offline without internet connection. 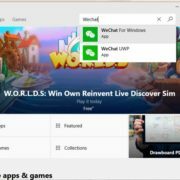 You can use the same account to stream-across multiple devices. 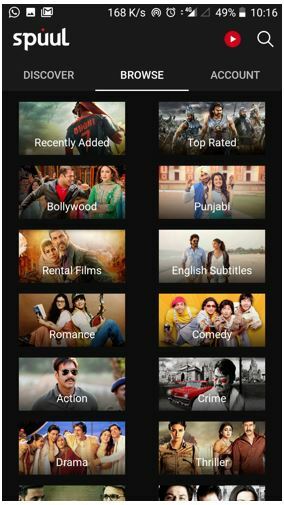 The Discover tab divided into the different sections such as New on Spuul, Featured, Dosti Special, Family, Real on Reel and more… You can browse these sections to watch your favorite movies. 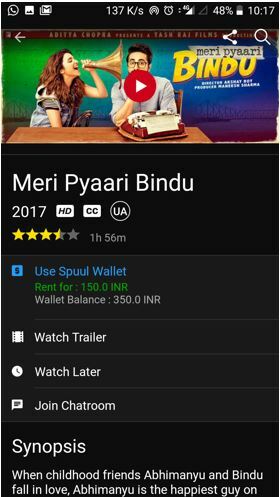 The app feels really refined and taps on any movie will give you detailed information whether it is available free or on rent, releasing year, video quality, subtitles, rating, option to watch the trailer before renting the movie, including film synopsis with character and filmmaker details. You can even join a chat room to discuss about the movie which you want to rent but doesn’t seem very active, may be due to lack of user interest. If you talk about the Spuul content library then it has a huge collection of Bollywood movies including the latest one and late 90’s. Apart from Bollywood, you can find regional movies like Punjabi. One thing which we noticed that in the app description at Google play store it is mentioned that the other language movies such as Tamil and Malayalam available too but we won’t able to find them apart from Hindi and Punjabi. Also, the app doesn’t show all the latest movies or blockbusters which means the Spuul content library is bit vacant and really disappointed us. 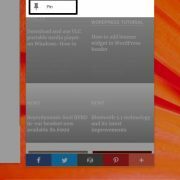 The Spuul app is available for both Android, iOS and can be accessed through a web interface. You can rent a movie for 72 hours. To rent a movie, just a click on your favorite one and you can see the price there. Now, click on the play button and you will redirect to the payment options. 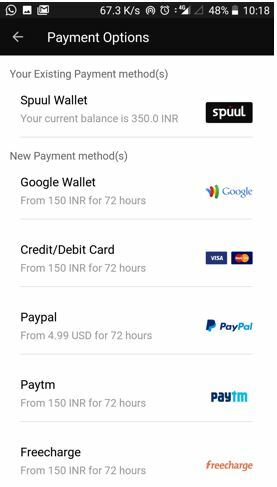 The options are the Spuul wallet, Google wallet, Credit/Debit card, Paypal, Paytm and Freecharge. If the movie is free you can watch or download them free cost. The video quality is available in multiple resolutions such as 144p, 240p, 360p, 480p, 720o and 1080p. 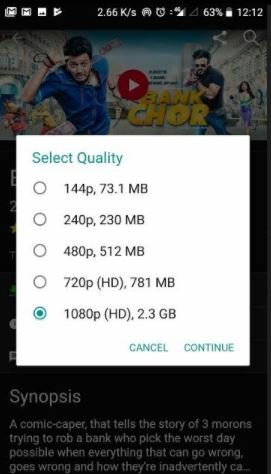 The video can be download in different size according to the video quality. Setting up the Spuul is very easy and hasn’t shown any error or lag even while playing the movies, at least in our case. We have watched both premium and free movies without any buffering on 3G and 4G network. The best part is that the app supports the 1080P resolution that means you can directly cast them on your Smart Tv without compromising the quality. The app offers both free and premium subscriptions. In the standard edition, all movies which are free can be watched. However, for big Bollywood hits, you need to shell out some money. The premium subscription is come at the price of USD 4.99/month and for Indian users at Rs 150/month. One more thing we have seen that even after premium subscription all the movies are not free to watch some of them you have to rent. However, INR 150/month does make sense as you can download and store the movies on your SD card to watch offline. Also, only the premium users will get an ad-free experience on the Spuul app.